Simplifying the developer experience in the cloud has been a priority for DigitalOcean since we launched Droplets in 2013. 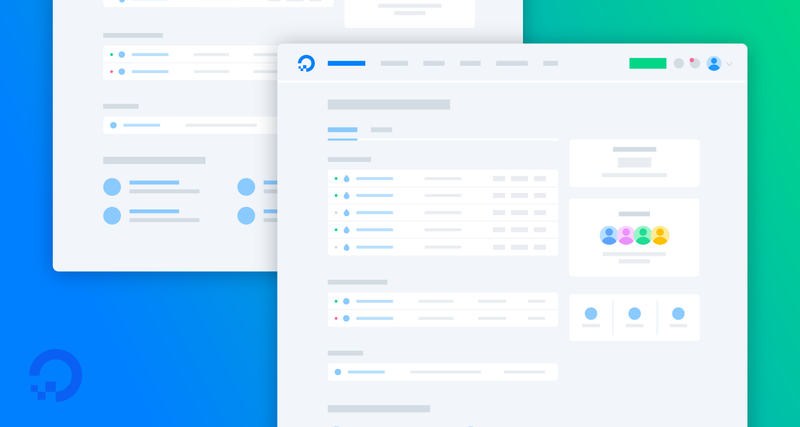 As our product capabilities grow, we're taking great care to ensure that using DigitalOcean to run your applications remains as easy and intuitive as possible. Today, we’re announcing the Control Panel Dashboard, the first of many Control Panel updates planned for 2018 as part of our mission to make it simple for development teams to operate and scale production applications in the cloud. Every day as we talk to developers, read feedback from the community, and witness the amazing applications being launched on our platform, the message that rings the clearest is that everyone values simplicity and ease of use. Visualizing, understanding, and controlling your cloud infrastructure in a single place is not inherently simple or easy, and it can get significantly more difficult as complexity increases. The release of the new Dashboard is specifically meant to help you quickly access your existing resources and key account-related information, while highlighting additional products and features we think you’ll find useful when deploying scalable, production-ready infrastructure. For existing users, the Dashboard replaces the Droplets page as the new default home page of the Control Panel. It provides “at-a-glance” visibility into active resources, like Droplets, Spaces, Load Balancers, Domains, Floating IPs, month-to-date current billing usage, shortcuts to team management, and other common tasks without having to navigate to different, often hard-to-find, sections of the Control Panel. A look at the new Control Panel Dashboard. Additionally, we’ve made changes to the top and bottom navigation to expose more helpful links to our status page, Community tutorials, API docs, and the support portal. All with the goal of surfacing more ways to help keep your applications running smoothly without overloading the UI. The Dashboard is just the beginning. We have many more updates planned this year, and we can’t do it without your continued feedback. When you log in to take a look, please leave us some feedback using the little megaphone icon in the bottom right corner of the Control Panel. Or get early access to upcoming features by completing this survey. The new Control Panel Dashboard is available starting today and will roll out to all DigitalOcean users over the course of the week. Stay tuned for more UI updates in the future!